If you are planning a trip to New England early this summer you may want to include a stop at an exhibit guest curated by Jennifer Sapiel Neptune. Spirit of the Basket Tree focuses on the rich visual dialogue between contemporary Wabanaki basket artists of Maine and the legacy of Native American basket making in northern New England and southeastern Canada. 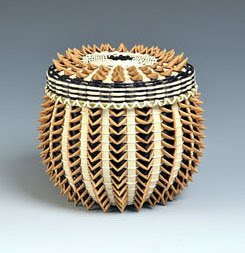 Active basketmakers Fred Tomah, Ganessa Bryant, Caron Shay are featured. The exhibit is taking place at the Hood Museum of Art, Dartmouth College, Hanover, New Hampshire and is ongoing until June 28, 2009. In advance of your trip you may wish to read this review of the show or browse the Brown Ash Basket offerings of the online shop American Native Downeast. Shop owner Bobby Ann Packwood deals directly with many of the most talented active Native American basketmakers from Maine. She regularly offers vintage, antique and new Maine native brown ash woodsplint baskets created by Pam Cunningham, Joyce Tomah, Ganessa, Jeremy Frey, Gal Frey, Eric "Otter" Bacon and other accomplished Micmac, Passamaquoddy and Penobscot basketmakers. You may find sewing, corn, creel, carrot, acorn, strawberry and mini baskets made with ash splint and sweetgrass that include porcupine twist curls. Also holiday items such as Christmas tree ornaments and Valentines Day sweetheart baskets along with other traditional Maine basketwork. Much more about Black ash basketry can be found at BasketMakers.com.